I first found Barbara of Winos and Foodies through her Taste of Yellow event, a celebration of surviving cancer. Barbara really tugged at our hearts with her determination to beat cancer and for taking positive steps to raise cancer awareness, and many of us have participated in Taste of Yellow for the past two years. Barbara is fighting again with a massive round of chemotherapy, and she’s got a long road ahead. Bron of Bron Marshall and Ilva of Lucullian Delights organized some virtual hugs for Barbara as a way for us to let her know we support her, even if we can’t be there in person. For my hug, I wanted to send Barbara some comfort food: a squash soup with saffron to lift her spirits and fresh ginger for her appetite. This vegan soup calls for light coconut milk though you can use soy milk if you prefer, and yes, the cilantro is optional. Bron and Ilva are keeping track of all the hugs for Barbara, so please visit them for links to all the posts. And make sure you read Barbara’s touching post with her thanks. Wash the outside of the squash and split it down the middle from top to bottom. Scoop out the seeds and stringy bits and set aside. (I save the seeds for planting.) Place the squash inside part down on the prepared baking sheet and roast until the skin is browning and feels soft under slight pressure. While the squash roasts, warm the olive oil in the pot over medium high heat. Add the onions, leeks, garlic, and ginger and cook for a few minutes until the onions and leeks are soft and translucent. Turn off the heat and cover until the squash is ready. 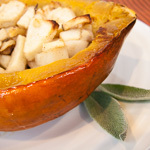 Remove the finished squash from the oven and cool for a few minutes, then scoop out all the flesh. Add to the pot along with the nutmeg, saffron, and cilantro (optional). Cook and stir for a few minutes until the squash starts to mix in and the nutmeg and saffron become fragrant. Add the coconut milk, vegetable stock, and bay leaves and bring to a boil. Turn back the heat and simmer for about 15 to 20 minutes. Take soup off the heat. If you have an immersion (stick blender), run that around the soup for about 30 seconds to puree some of the chunky pieces. 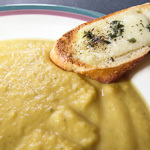 If you do not have an immersion blender, pour about 2 cups of the soup into a blender jar and puree, then pour back into the pot and stir well. Serve with salad and sliced baguette for dipping. Thanks Andrea for participating! A truly comforting hug and soup! 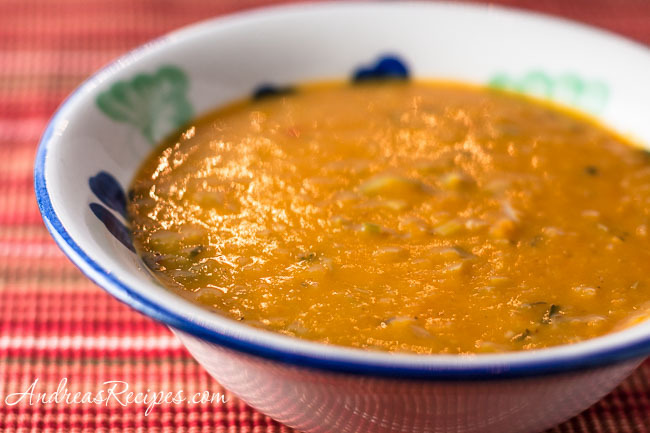 Thank you Andrea, Squash soup is definitely love in a bowl and I really like the idea of adding saffron and ginger, so must try that when they cme back into season here. Thank you so much again for joining in with our hugs for Barbara! Andrea this looks delicious. I know I would love it, especially with the coconut milk, ginger and saffron. Thank you and a sunny virtual hug right back at you. Beautiful, healthy and sunny hug! What a great recipe and a very sweet hug to send to Barbara. The soup looks and sounds fantastic. 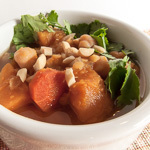 The bright, warm, cheeriness of this soup does give it a “hug in a bowl” look. Terrific of you to work this in for Barbara with all the cookie baking and good to know there’s a giant cyberhug brewing for her out there! This is a fantastic recipe very comforting! Lovely & kind words, as you always project! Thanks for the beautiful recipe! How many does this serve?